One of the things on my bucket list and my “places to visit before I die” list is New York City. So, after realizing we had some vacation money saved up and could afford to go, we decided to just do it!! 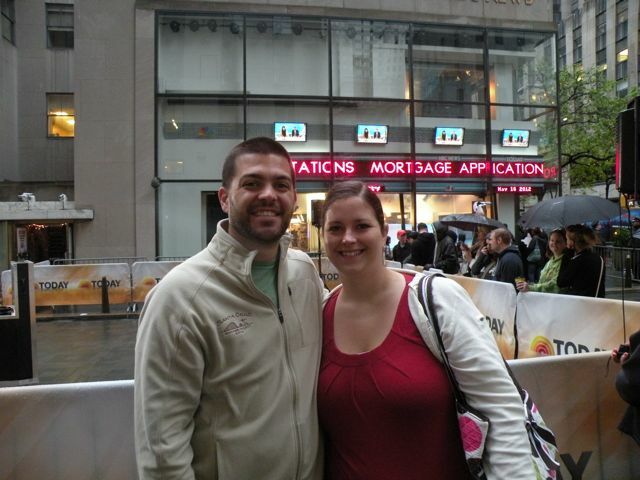 We left Kinsley with Ed’s parents while we traveled as we knew it would be hard to tour around NYC with a 2 year old. It worked out well that this trip was also a celebration for our 7 year anniversary and a babymoon trip before this 2nd one makes his/her arrival! We arrived in New York City on Tuesday morning after a very early flight! The plane trip itself was very comical as we listened to this 3 women behind us talking with a African American basketball player (he lives in NYC but plays at Middle Tennessee State Univ) about places to see in New York and how to get around as they were visiting for their first time too. The part that was funny was that they referred to themselves as “3 white people” about 4 times in the conversation. Ed and I just hung our heads as we listened knowing that with the more interaction we have had with working with different ethnicities, the more we have learned that you never, ever refer to yourself as 3 white people or 3 black people or anything of that nature. How awkward. After arriving in NYC, we visited Central Park (we stayed only a half block away! ), got lunch, visited FAO Schwartz, Times Square, and saw some famous places like the Trump Tower, Tiffanys, and the Plaza. 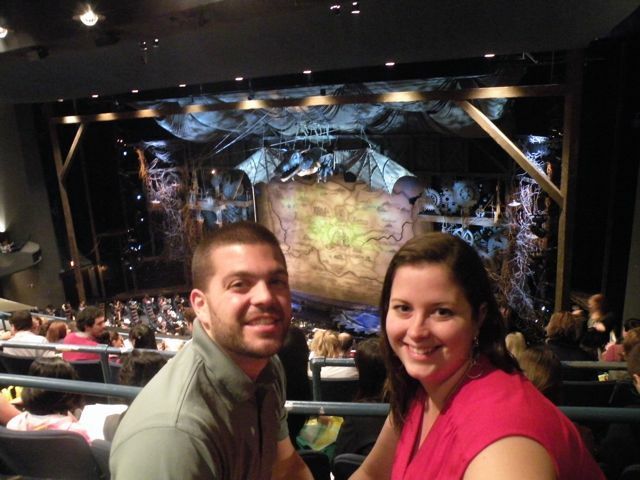 Then, that evening we saw Wicked on Broadway. It was comical and so much better than I thought it would be! I would definitely recommend it! decker bus tour through Downtown Manhattan. I loved getting to see the Garment District (thanks to my love of the show Project Runway), Wall Street, the Post Office, and so much more! And we learned so many things – one being that skyscrapers will buy air rights so that other buildings around them can’t build up and block their view – who knew? 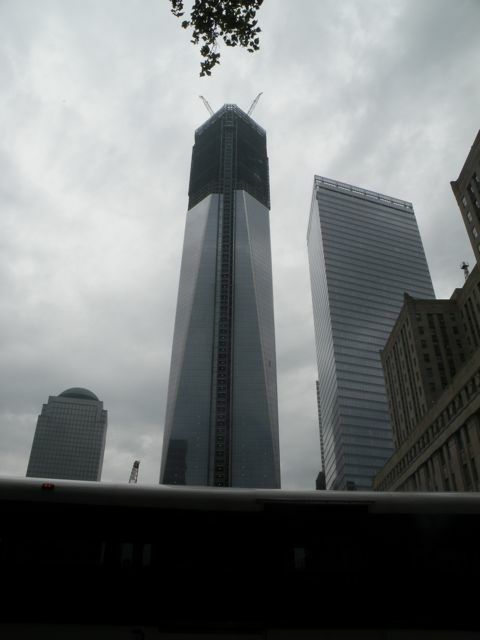 Then, we dined on New York style pizza, went and saw the Freedom Tower being built (in place of the World Trade Center towers), and visited the 911 memorial. 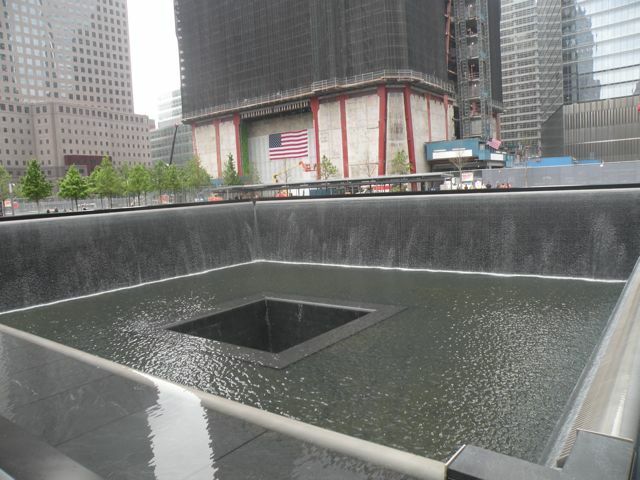 The memorial was very beautiful and touching, and such a somber time remembering 9/11/2011. 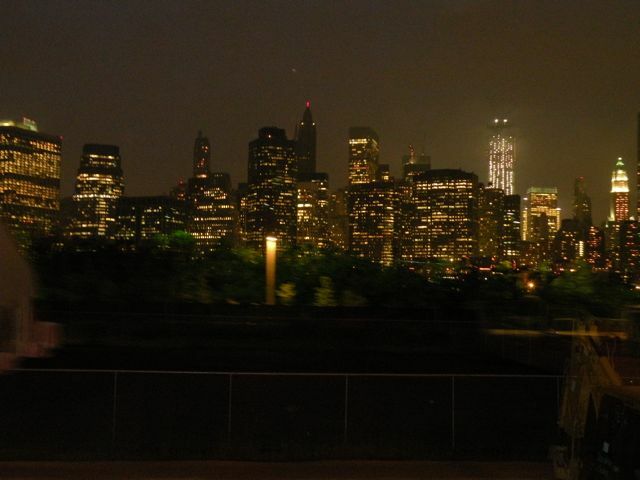 night, but also the New York skyline. This was definitely a view and sight that I could look at every night. 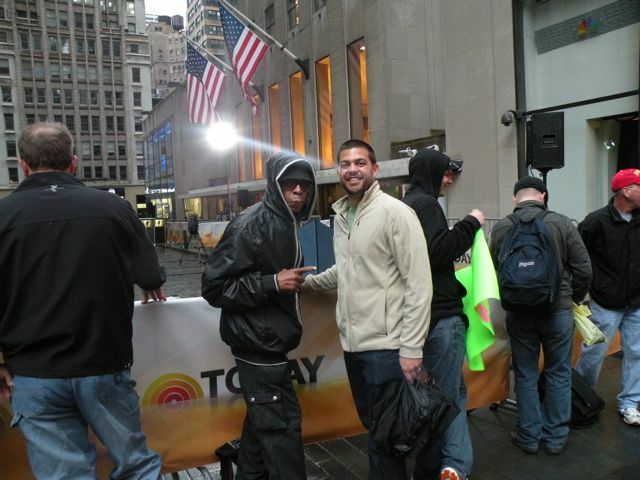 On Thursday morning, we woke up super early and went to try and get on the Today show. Ed and I love watching this show in the morning, so for us, this was another highlight of the trip. We got to see how they run the show behind the scenes, see how they select people for a makeover (they selected the lady next to us! 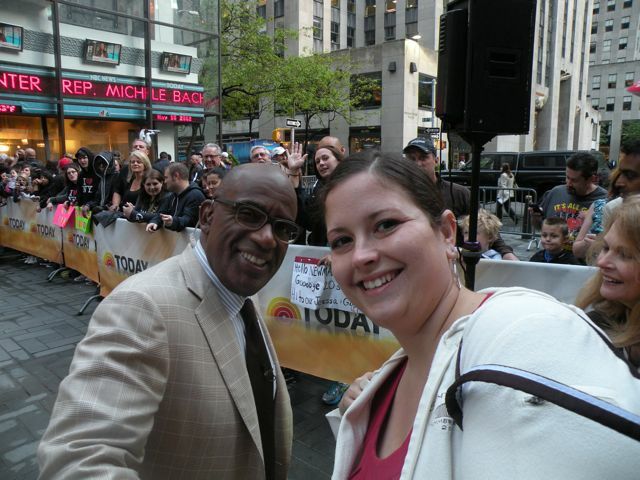 ), met and got a picture with Al Roker, and meet Lenny (this is the African American guy who is there in the crowd every day holding a banner and pointing). Howard Stern was the big guest of the day – now that I could have done without – even though he is really tall! Then we had a nice breakfast at a local breakfast joint, followed by a nap (we were wiped! ), and then bike riding around Central Park. After that, I got to reconnect with my old roommate from college (and bridesmaid at our wedding), Eden. Eden came on staff with Campus Crusade after graduation and eventually left staff after a few years upon deciding to pursue international business in NYC. She is currently working while she is pursuing a MBA in international business. Since it had been years since I had seen her, it was SO REFRESHING to catch up and share our lives with each other. When I shared with her how the only thing I wanted to do that had not happened yet was to see a celebrity, she decided to tell me (the last day!) that I should come eat at her place because they have celebrities there all the time (Usher was there the night before and she said it is Beyonce and Jay-Z’s favorite restaurant). Ahhh!! That will need to be on my list for next time…track celebrities around the city. The last thing we did was go to a Yankees game that evening. Ed LOVED being in their new stadium and was elated to find out two really good pitchers were going against each other – CC Sabathia and David Price (have never heard of him but hey, that’s not surprising. 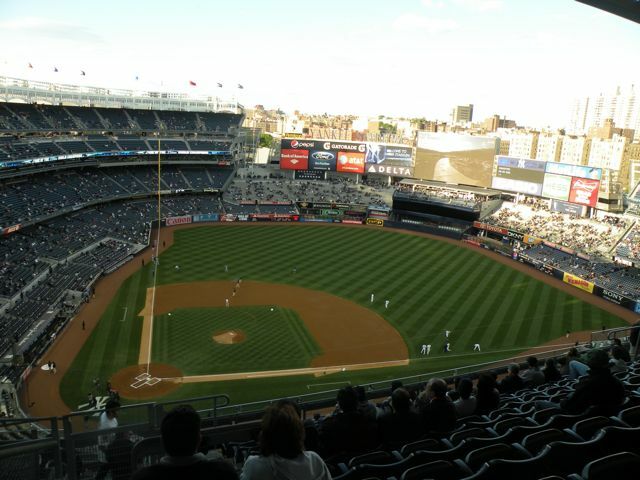 The Yankees won and all in all, it was a good game and a once in a lifetime experience! All in all, I LOVED NYC. I felt I was really easy to adapt, find my way around, and just fall in love because it was very similar to Russia. In Russia, we were used to no one speaking our language, not having a shower (we didn’t have one on our floor in the house we stayed out in NYC nor the hotel we stayed at in Russia), nobody looking like us, walking a lot, working the subway and tram system, not having a grocery store on every corner, etc and in New York, we experienced some of the same things (yes, I know English is the main language, but with it being such a melting pot of different cultures, we heard a gazillion different languages a day). Because of it being such a melting pot and everyone bringing in their own religion and Gods, the city is very dark and needs the Lord and to hear about Christ, and if one day God decided to call us there to minister, I would go in a heartbeat (we are content in Raleigh and have no plans of this happening – just saying). Please pray for this city that Christ will be made known and the Lord will raise up laborers who are willing to preach the Gospel in this area and reach the world in effect. Of course I love this!!!!! I’m so glad that you had a blast! !